In fiction, sometimes people die horrible, gruesome deaths. A good percentage of the time, these people are bad guys. Being bad guys, some of them are killed by good guys. This means that good guys slay people in horrible, gruesome ways. In some series, such as “The Vampire Diaries,” this is fairly commonplace. But, I’ve noticed that, in many series, there’s a catch. And that catch is the protagonist. And so, I’m dedicating this post to the discrepancy between protagonist and side character when it comes to death in fiction. Also, spoilers for up to tonight’s episode of “The Vampire Diaries,” with some extra Harry Potter and Hunger Games spoiler added for flavor. This graphic added to leave room between the intro and the spoilers. 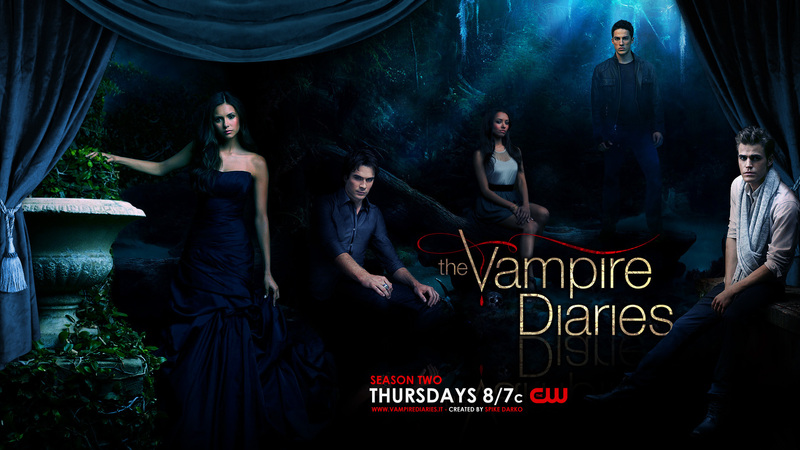 Also because see how Bonnie and Damon are vaguely near each other? Totes a thing. Just wait. I started watching “The Vampire Diaries” last year at the behest of Basil. Because she needed to talk about it. And I understand why. There are so many things that it’s almost about it’s amazing. But this isn’t about the lack of exploring of race or how friendships get neglected for the less-interesting romance plot lines. This is about Elena and her compassion. Damon, Stefan, Alaric, and Katherine all enter the show as killers of some sort. We know that they’re all older and more experienced with the supernatural and dealing with unpleasant forces. When they kill, it’s expected (not so much with Stefan at first, but I feel that if you’re surprised when a vampire kills someone, you really need to learn more about vampires). But the trio of friends we start with–Elena, Caroline, and Bonnie–are all normal teenagers. This all changes when Bonnie figures out she’s a witch, Caroline becomes a vampire, and Elena finds out she’s a doppelganger before becoming a vampire. Bonnie’s discovery and Caroline’s transformation are treated with somewhat of an air of banality. They’re just things that happen. It’s really one of the things I enjoy about the show. Anyone’s life can fall apart at any time. No season finales, no boss battles necessary. Now, certainly, this happens more during season finales and boss battles, but they don’t shy away from mid-season deaths. Elena’s is different. It’s a season finale transformation. It’s a cliffhanger. She awakens as a vampire one second before season 3 ends and deals with the repercussions as the season 4 opener. It’s exciting. It’s new. Except it’s not. It’s a little odd when a character becoming a vampire is treated as something uncertain and earth-shattering when your audience has watched countless characters be turned. Especially weird is the focus on the fact that Elena, as a vampire, may kill someone. When Bonnie discovers her powers, she quickly learns to cause repeated aneurisms to torture vampires into submission. She plays a key role into taking down several baddies, many of whom died as a result of her actions. Caroline, who, it’s mentioned, copes really well with being a vampire, kills a man as one of her first acts and proceeds to have few qualms with taking down anyone who’s a threat. But the number one concern when Elena turns is that she might kill someone. Because she might not be able to take it. Because of her overwhelming compassion. This is a legitimate character trait. But I feel I’ve heard it before. I feel that there are actually very few heroines that aren’t compassionate. And not just in a “I’m nice” way. In a “this is one of my stated character traits” way. I think it’s supposed to make them more understandable to the audience. What teenage gir–I mean, person doesn’t want to be compassionate? This aversion to having the viewpoint character kill is understandable. We’re supposed to feel along with them, rather than for them. Most people haven’t killed anyone and would be upset if they had to. While we can understand that Bonnie and Caroline would be upset after hurting people, we’re meant, largely, to be sympathetic, rather than empathetic. We are Elena. When there are things that we couldn’t handle, she can’t handle them. And when she finally does kill someone, she breaks down. The other characters are upset, but not to the same extent. They move on quickly, because, on some level, their morality isn’t what we’re concerned with. By no means is this exclusive to this series or even this genre. Harry Potter contains much the same thing. Harry is unwilling to cast anything but a disarming charm when Death Eaters pursue him (though, I oddly willing to cast Imperius when it’s necessary, but that’s a different article). Even the Hunger Games’ Katniss is subject to this. She never kills anyone you don’t feel deserve it. In fact, she very rarely directly kills anyone, which is odd for a series centered around a killing game. Overall, it’s a completely understandable want. Your viewpoint character should be likeable and relateable. At the same time, it leads to a situation in which main characters are treated completely differently. It leads to a moral disconnect between what the main character can do and what a minor character can do. Moreover, it makes a lot of main characters, well, a bit dull. They have to have someone fight for them, at least in some regards, because they can’t kill. In the end, I think it’s why there are often fewer fans of main characters. I’m not really that involved in TVD fandom enough to say much about Elena, but within the world of Harry Potter fandom, Harry’s not super popular. Because, sometimes, empathetic characters just aren’t what you want. Sometimes, you want a character that’s allowed to do what’s necessary. Who’s allowed to not angst over killing the bad guys. A character who can do what you want, not what you do.